The Via Francigena , declared a "Cultural Route by the Council of Europe” , is a true road system, a system of distances branched over time and ground. The name "Francigena” was given to a major route which connected the cities of the Italian peninsula with the world beyond the Alps. "Francigena” identified, in fact, a route coming from France. When the "Via Francigena” is mentioned, this generally refers to the Via Francigena according to the route taken by Sigeric, or better yet, to the stages as were described by the Archbishop of Canterbury on his return from Rome. In his journal, 80 stages are listed: Vercelli is the 43rd. Vercelli, of ancient origin perhaps Celtic, during Roman times was an important settlement, then a religious centre, a Longobard dukedom, a "free county” and later on an independent municipality, which thrived in the 1200's. Since the Medieval, Vercelli has conserved numerous examples of its worthy heritage, among which the beautiful abbey of Sant'Andrea, which is one of first and more important examples of transition between the Lombardic-Emilian Romanesque style and the Gothic architecture of beyond the Alps. Vercelli represented an important transit centre for both the pilgrims going to Rome as well as for the merchants travelling throughout Europe. It is for this very mass of people that a solid structure of hospitality was developed. Today Vercelli has kept alive its central position, which its historical role can be attributed to the Via Francigena. Vercelli is a member of the European Association of the Vie Francigene.  Vercelli still represents today an important centre along the Vie Francigene because Vercelli is where the different routes heading to Rome meet. Go through the passes and you will arrive in Aosta. Go through the Valley: you will first come to the Province of Turin with the city of Ivrea, then the province of Biella by means of Lake Viverone and the town of Cavaglià. You will reach the Province of Vercelli at Santhià where you will then follow the way in the direction of Vercelli. Pass San Germano Vercellese, Cascine Strà and you will end up in Vercelli. Considering highway n. 11 has quite a lot of traffic, an alternative is the following: before arriving in Cascina Strà, on the left, you will come across the provincial road for Olcenengo. Once you arrive in this small centre, take the provincial road heading towards Vercelli. This will lead you into Vercelli in Strada Olcenengo; at the end of this road, you will come to an overpass. Take the steps to the top and continue along until the Piazza Roma. The first route passes the Dora Baltea between Borgoregio and Saluggia and heads towards Saluggia, Livorno Ferraris, Bianzè and finally Santhià, where it then meets up with the branch of the Via Francigena coming from the Great St. Bernard Pass. The second route parallels the Po River and passes through Crescentino, Fontanetto Po and Palazzolo Vercellese, where it then heads north towards Tricerroand Desana and finally Vercelli in Via Trino. The third route, probably the shortest and most interesting due to the dirt roads, starts from Saluggia and heads towards Lamporo. It passes the Primavera Cascina (farmstead) and crosses the Cavour canal near Lamporo. Once it arrives in the town centre, it goes towards Castell’Apertole (castle)and continues along the country roads. Shortly before reaching the town, the road turns into an asphalted road. At this point, it turns right towards the Castell’ Apertole, after which continues on in the direction of Vercelli. It enters Vercelli in via Trino. Leave Vercelli and follow along Corso Matteotti. Take the bridge that crosses the Sesia on the right-hand side of the road. Once you reach the large curve in the road, turn immediately to the right and take the main road leading to Boarone. Near the Boarone Cascina (farmstead), turn again to the right and continue to the Sesia riverbank. Follow along the bank until Palestro. Near Palestro, the Vercelli Province and Piedmont Region end and the Lombardy Region begins. Leave Vercelli and take the bridge over the Sesia River. Turn immediately to the right onto a dirt road. Follow along for about 300 meters. On the left you will see an old farmhouse. Turn right after it and continue to the riverbank. Carry on for about 10 km until you reach Palestro. Where to sleep and Where to eat:For a complete list of accommodations and restaurants in Vercelli and the Province of Vercelli, please visit the sections "Where to sleep” and "Where to eat” on the website. Public Drinking Fountains: Piazza Roma, in front of the Bar located in the train station; Piazza Cavour, in front of the Bar Cavour. Association headquarters "Amici della Via Francigena di Vercelli"